For tough, not so ordinary cleaning jobs, look to the Mi-T-M 1500 PSI Electric Pressure Washer. The CD Series is designed for all-purpose cleaning, such as washing siding on a house or cleaning electric equipment. The cold water direct drive 2.0 horsepower pressure washer will meet your needs. Able to reach 1500 PSI during use, this machine is assured to do the job quickly and efficiently. The totally enclosed fan-cooled electric motor with manual thermal overload protection ensures your motor will run strong from start to finish. It also features a powder-coated steel mounting plate with center balanced lift and four rubber isolators, as well as low pressure detergent injection. 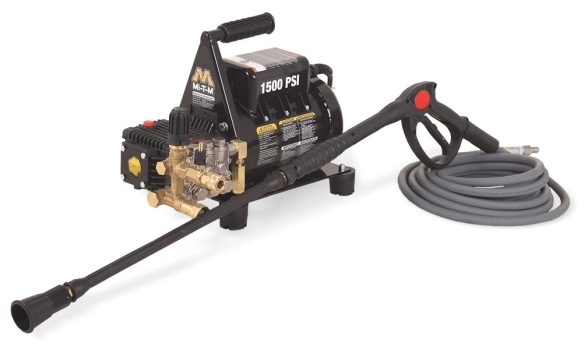 The lightweight CD pressure washer is ideal for homeowners and small industrial jobs. This quiet, electric model is perfect for applications where exhaust fumes are not allowed. Click to read "Does Your Garage have a Pressure Washer Surface Cleaner?" on our blog. For more power and greater pressure, did you know that we also have a 5000 psi pressure washer? Find it here.